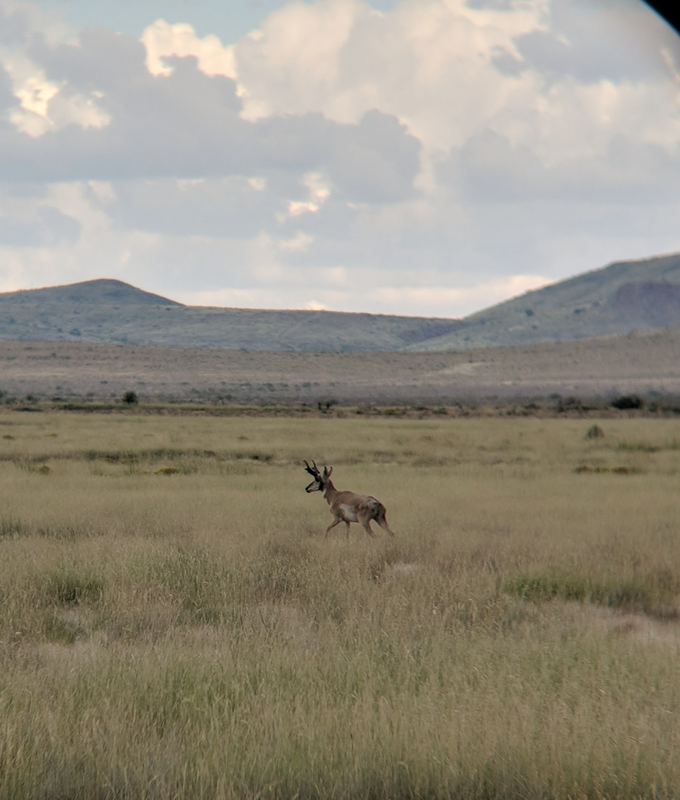 A Pronghorn runs through a field of tobosagrass as storm clouds gather on the horizon (photo by Christina Partipilo). I have worked on IAE’s seed crew before, but this is my first time in the American Southwest. These past few weeks have been a flurry of learning strange new species, keying out grasses, and getting my hands dirty in the field. As if that wouldn’t keep me busy enough, New Mexico is full of new sights, sounds, and smells. Last week, our crew was out in the Chihuahuan Desert in search of alkali sacaton and other grass species. Our hitch was very eventful, and included lots of grass seed collections and getting caught in a rainstorm. So far this season, pollinators have been our constant companions. As someone who has spent their life on the West coast, the diversity of pollinators here has me completely floored. From birds, to moths, to bees masquerading as flies, the pollinators have us surrounded during our collections. I feel like I’m adjusting well to this new position, and look forward to all the surprises the rest of the season is sure to bring on. Like the seasons change, our work changes too. We follow the transitions of seasons from spring to summer to fall to winter. Basking in the sun along with plants who need it for growth. Being one with the environment for a brief second. It’s almost as if we are one. Rhythmically collecting seed to the sounds surrounding us. As fall comes things go dormant. Storing nutrients in their root systems for the winter that is coming. We as well store energy for the work that is needed indoors. Have brought us together to assess the native plants we have worked with. Re-emerging into the field as plants return to the landscapes. For one of the last seed collections of the season, I joined two BLM interns for some collections and scouting in Santa Fe County. Our first stop was to the Leonora Curtin Wetland Preserve, adjacent to La Cienega. At this point in the season, the Preserve is closed to the public. The path through the Preserve is lined with an assortment of plants and flowers with a cover of trees almost enclosing you on the trail. On our lookout for Helianthus annuus (common sunflower), Sam and I spotted the Rocky Mountain Bee Plant, known scientifically as Cleome serrulata. Sam and I collected some of its bean-like pods. Cleome serrulata is a warm season annual found throughout the west, southwest, midwestern US and Canada. It is very popular among pollinators, which is no surprise given that a pollinator is in its common name. After collecting some of this population’s seed, we headed to help Ella with another seed collection and voucher. Some time later, I was at the seed ranch to clean seed from all of the collection sites from the last of the season’s collections. While I was searching for the next round of seed to clean, I spotted the Cleome serrulata that I helped to collect at the Leonora Curtin Wetland Preserve. This particular plant is one of the easiest to clean quickly with the sieves and sifters available at the Seed Ranch. Cleome serrulata’s seeds are nearly black, sometimes spotted grey resembling small peas. They easily fall from their pods with a simple shake. After removing the seed from the plant, I ran the seed through the air separator in order to get rid of any non viable seed. After collecting, sifting and sieving, and then packing up the seed, I was able to join this plant on its journey from the preserve to being preserved for a future restoration or reclamation project. On October 7th, I helped Shawn lead a seed collection workshop with the Quivira Coalition at the Red Canyon Reserve, south of Socorro, New Mexico. It was an excellent opportunity to share the skills that I have garnered over this past field season and connect with some new folks interested in native seed collection. Four months prior, my fellow BLM botany interns and I had our first New Mexico botany foray at the reserve, led by BLM botanists Patrick Alexander and Lillis Urban. At that training, we applied the Seeds of Success collection protocols for the first time and experienced a taste of the diverse flora that inhabits the Chihuahuan Desert ecoregion. Returning to this peaceful place with a goal to empower others in native seed collection helped to take my experience full circle, and gave me an opportunity to educate the audience on our efforts with the Southwest Seed Partnership. The gathering was cozy enough to have a conversation with everyone, yet diverse, including people from ranching, restoration, indigenous ethnobotany, and environmental media backgrounds. I was both surprised and stimulated by the group’s enthusiasm and curiosity for seed collection. After months of following routine collection protocols, it was refreshing to remember that there are always so many more questions to ask about our work. My favorite question was, “what level of experience or education do you need to collect seed?” Shawn was astute to point out that one doesn’t need much experience or even a college diploma to collect and use native seed – only the interest and general guidelines to do so in an effective and responsible manner. With the group’s newfound joy for seed collection, we were able to quickly harvest a collection of sideoats grama (Bouteloua curtipendula), one of our prioritized grass species that is highly demanded by native plant producers. While collecting seeds with an elderly Navajo gentleman, I was delighted to hear about the story of the plants from his cultural perspective. I was reminded that native plant conservation plays a critical role in sustaining the integrity of ecosystems and human cultures alike. After demonstrating how to collect seeds and the accompanying data, we were treated to a walking tour led by Steve Carson of the restoration firm Rangeland Hands. He showed us the progress that they had made to remedy erosion from past overgrazing on the site, with clear signs of success. Looking at the lush vegetation growing in the drainages, it was difficult to envision the barren state of the land just 15 years ago. It was fascinating to hear Steve explain the rock work structures he had installed, and how they help to divert and distribute the flow of water over the land, preventing erosion. I was intrigued by how the hydrology of the land related to its revegetation, and the success of native plant restoration. Furthermore, I was impressed by the fact that these restoration projects were carried out with a minimum of equipment, by using the helping hands of many volunteers. The day ended on an idyllic note, with a hike down into Red Canyon. Among the storied rock walls, we found beautiful and cryptic petroglyphs from the ancient Mimbres culture. With awe, we watched a barred owl leave its roost and alight among the cottonwoods. And we left the canyon, knowing that our conservation efforts can have lasting and life-giving effects in the fragile desert landscape we inhabit. A few weeks ago we had the pleasure of visiting Curtis & Curtis Inc. and Bamert Seed to meet some of the Southwest’s native seed production experts. We were amazed to see the scale of production at which they operate, imagining how our native seeds could be grown out and utilized at such a scale in the future. Beyond seeing their fields, seed cleaning facilities, and massive seed storage warehouses, we engaged in encouraging conversations regarding the prospect of a future native seed market concerned primarily with genetically diverse, locally adapted, wild collected, native species. We were excited to hear that some of their efforts are already being redirected from a historically agricultural focus to more of a reclamation focus. Wild collected seeds offer a milieu of benefits to the environment tied to their inherent genetic diversity. 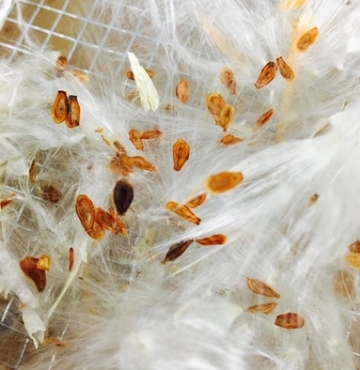 The demand within the native seed market is shifting, so the hope is that the industry will as well. Because the demand for appropriate native seed is increasing every day, it is exciting to be a part of this pivotal stage in the seed industry. Just think of the impact the native seed industry could make on the more than eight million acres that have already been subjected to wildfires this year. The hope is that large scale programs like BAER (Burned Area Emergency Response) will diversify their presently all grass mixes and that highway revegetation efforts, for example, will enter into agreements to apply the right seed onto immense expanses of roadsides. The increase in the use of genetically diverse, wild collected seeds, mixed with a greater emphasis on wildflowers rather than solely native grasses represents an important paradigm shift within the restoration community! It has been quite a busy 3 weeks for me with the Southwest Seed Partnership. We were in Taos for a few days for the Native Plant Society of New Mexico annual meeting. A few of us drove down to Clovis, NM and Muleshoe, TX for a couple days to visit Curtis & Curtis Seed & Supply, and their friendly competitors Bamert Seed Company across the border in Texas. Just a few short hours at home after that trip, we loaded up and headed down to the Gila River Festival in Silver City. To cap all of that off, I extended my travels to Patagonia, AZ to visit friends and collaborators at Borderlands Restoration. Travel may sound like fun, but this was a lot of work! In total, we covered over 1,650 miles in two weeks, met with partners in 3 states, held a workshop, and got to mingle with dozens of fellow plant lovers. This is a grassroots campaign that requires significant effort from all involved to sow the seeds of success to build a better way to implement restoration activities in the southwest (and there goes my budgeted amount of metaphors for these blog posts). The Native Plant Society meeting was inspiring and educational. The theme of the entire meeting was SEEDS! Needless to say, we were very involved. We and our partners gave presentations, participated in the poster session, we hosted a seed collecting workshop, and we advertised at a table during the course of the conference. Set at the Ft. Burgwin campus of the Southern Methodist University, it was a relaxed atmosphere that encouraged contemplation over the value and importance of seed. We really enjoyed the meeting, and I hope people got as much from our participation in the meeting as we got from interacting with them. The trip to the High Plains was really exciting. We probably got to see more than most people would, but that assumes that other people get excited to tour seed production facilities. But given that we're in the early stages of the blog here, and if you're reading this, you're probably just as big of a plant nerd as we are, then you probably get my drift. We've been so dialed into seed collection (by hand), that this was an excellent opportunity to see the next step in the Southwest Seed Partnership: putting our seed into production. I should clarify - neither Curtis & Curtis, nor Bamert are putting our seed into production yet. But we got to tour their facilities to see how they take seed, put it into production, and harvest seed that would go into restoration marketplaces. They are working with quantities of seed that dwarf our bags of hand collected seed. But working with Blake, Mark, Brett, and Rhett gives us optimism that they can help to scale up our operations to service the southwest, and provide more locally-adapted seed to restoration projects across Arizona and New Mexico. The Gila River Festival provided a fun opportunity to experience the cultural delight that is Silver City. The festival organizers allowed us to host a table at the main seminar venue, so we were able to talk to folks from around the country who came to celebrate the Gila River. So many people were excited about our Forest Bound curriculum, and our efforts to collect and produce milkweed to support pollinators. It was a rejuvenating experience after spending so many days on the road at that point. The last stop on my min-odyssey was a trip to Patagonia, where I was reminded of the beauty of southern Arizona. On the way down highway 83, I even got to take a glimpse from the road of my masters research project site. If you haven't been to Patagonia, or seen the Borderlands Restoration facilities, you're really missing out. The whole team, but Francesca and Allegra in particular, have really created something special down there. The seed lab at the old Patagonia Elementary school, the nursery, the production fields - it's all so encouraging! I know I only briefly touched on events that deserve more thorough reflections, but I don't want to spoil upcoming entries from new contributors. Stay tuned! On September 21, two YCC crew members, two Santa Fe Botanical Garden volunteers and Yvonne Hickerson put up yet another brave fight of many against a very menacing teasel population. Although out-numbered 1000 to 1, we prevailed and made a very big dent in the population. We re-grouped and plotted our attack for next year, vowing to take revenge for our sore hands and blisters. It has been a privilege to work in collaboration with the Santo Domingo Natural Resources Department. They were very welcoming and the knowledge was interchanging: from me providing them with information on how we scout, identify, collect, GPS, etc... and they shared with me their traditional ecological knowledge that has been passed on through generations. We went on a full day scouting tour, covering many places within the reservation. From scrublands to woodlands to grasslands and a mosaic between. Driving around this pristine land that has carried so much history for this community's tradition and culture was a pleasure. Driving through massive populations of Cleome serrulata (Rocky Mountain Bee Plant) and Bouteloua curtipendula (Sideoats Grama) growing over recovered grazing plots, and Helianthus annuus (Annual Sunflower) emerging from the acequias along fields of corn, as well as sugar cane, melons, beans, and squash everywhere I turned. This trip not only introduced us to newly found scouting locations for potential collections, but also to a pathway to working with other tribes. Working outdoors for the past 3 months has been full of adventure. We have traveled across New Mexico, from Soccorro, Los Lunas, Pecos, Los Alamos, Jemez, San Luis Mesa, San Ysidro, Buckman, to numerous other trails and public lands throughout the summer. Learning about the diversity of flora of New Mexico has truly been the best part. I came into this job without any botanical experience 2 years ago, and now I am very pleased to see how much I’ve learned. I went from carrying New Mexican Wildflower and Grass field guides along with me on every outing to now firmly and confidently identifying a species in the field without need for a field guide. When out in the field scouting and collecting native seed, it is always fun. It’s very soothing to be collecting a native species on a site, immersed in nature fully, knowing that it is for the great good of restoration purposes. Not to mention, I'm lucky being in such a diverse state where there’s a matrix of ecoregions so beautifully put together to explore and learn. The Southwest Seed Partnership has provided me so many opportunities already to meet people from all across New Mexico and see the amazing things they're doing to improve the natural world. In the process, I've seen some truly beautiful corners of the Land of Enchantment. And to think, I've only been doing this for 4 months! There's so much more to see and learn. In the last two weeks, I've visited nurseries at the Pueblo of Tesuque and the Rio Grande Community Farm in Albuquerque. At Tesuque, it was a treat to learn from the formidable force that is Emigdio Ballon and see all the work that he's put into providing fresh food and traditional medicinal herbs to the people of the Tesuque Pueblo. Sean Ludden graciously made time in his busy schedule to show us the wonderfully diverse organic farm he oversees at the Rio Grande Community Farm. While we were there, he even offered a small plot for us to start demonstration projects for seed production fields under organic settings. The positive energy provided by these people is heartening, and encourages us that we're ready to take the Southwest Seed Partnership to the next phase, building upon the fruits of our nation-leading seed collection crews' efforts these past two years. I really appreciate everyone who has helped us get to this point, and can't wait to help write the next chapter. Learning these plants is never a bore. Yellow aster growing along roads with ease. Got the bees pollinating, growin’ in power. Graminoids with an abundance like pie. Their seeds ripen and ready only in the fall. The phenology of these plants is such a ball. I love being able to see the shift so slow. It is meditative focusing my energy on this subject. To make this world more green, native, and wild by the hour! Botanical education is of utmost importance as the global environment adjusts to the forces of humanity. Despite the need for this kind of education, botanical education programs are slowly disappearing from many universities. Herbaria are important botanical education resources; these institutions assist with plant identification, provide information on the location of plant populations, and can even provide insight into historic phenological patterns. As the Southwest Seed Partnership grows and plant conservation efforts expand in New Mexico, local botanical education resources are gaining importance for introducing incoming botanists and conservation biologists to the incredible diversity of New Mexico’s flora. In response to this need for additional, local botanical education resources, the Southwest Seed Partnership seed collection crew collected over 500 voucher specimens for the establishment of the BLM New Mexico State Office Herbarium. The herbarium collection is currently comprised of 183 specimens, represented by 105 unique species. This collection of botanical specimens will continue to grow in the coming years as wild seed collection crews recognize new species for additional reference material. These specimens have been digitized and will be made available to the public soon!